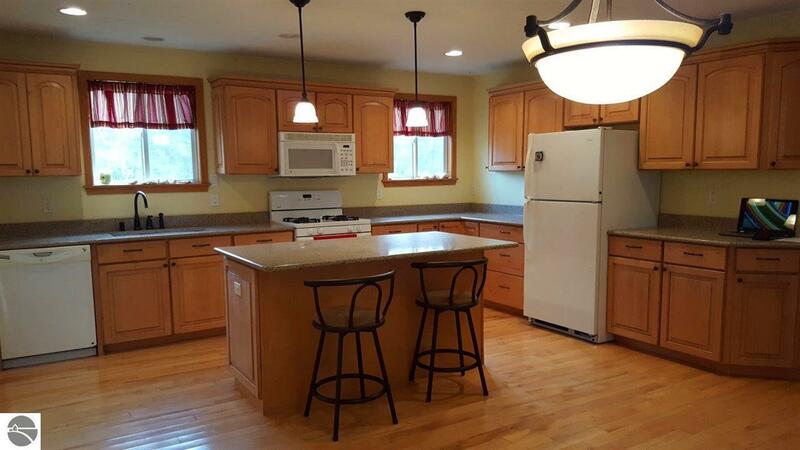 This recently updated Alden country home offers 2 Br, 1 Ba, Granite kitchen counter tops with island, custom cabinets, hardwood flooring, large living room with wood burning fireplace, 36' x 26' detached garage-(needs paint), metal roof & furnace about 10 years old. The sellers currently enjoy a fire-pit at the back of the property that looks at Spencer Creek. Torch Lake and Downtown Alden are less than a mile away! Perfect starter or private up north getaway home! Bedroom 1 Size: 16'7" x 9'7"
Kit Size: Combo x 15'7"